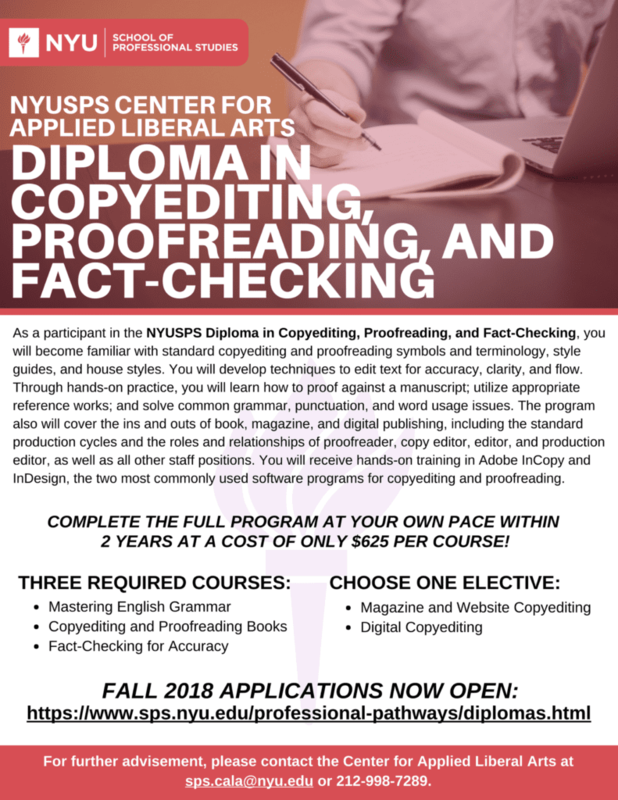 Apply for the NYUSPS Diploma in Copyediting, Proofreading, and Fact-Checking This Fall! This Fall, NYUSPS CALA will be offering the Diploma in Copyediting, Proofreading, and Fact-Checking, designed to prepare students for a career in the publishing industry across all forms of media. Participants in the program will become familiarized with standard copyediting and proofreading symbols and terminology, style guides, and house styles. They will also learn the ins and outs of book, magazine and digital publishing, including the standard production cycles and the roles and relationships of proofreader, copy editor, editor, and production editor, as well as all other staff positions. Applications for the Fall 2018 semester open on July 5th!